In the year 395 AD the Emperor Theodosius decreed that all soothsayers and their like were prohibited. This was a great blow to the Temple. Nature also played its part. In the second century BC, an earthquake struck destroying some of the Sacred Road and the area of worship to Artemis. Christianity was first introduced to Didyma in the fourth century AD. During the 5th and 6th centuries AD the Temple area was converted into a church. The final plan for the Temple was never fully accomplished. The whole area was devastated by another earthquake, that of the year 1493, and the site was abondoned. At the end on the 19th century new immigrants settled and gave their home the name "Yoran". From 1922 onwards it was settled by Greeks and Bulgarians. The small town they founded was called Yenihisar. Later this was changed to become the Didim today. Didyma's ancient ruins are 20 kilometres (32 miles) from Miletos, in the parish of Hisar, which is in the district of Didim, a part of the province of Aydin. 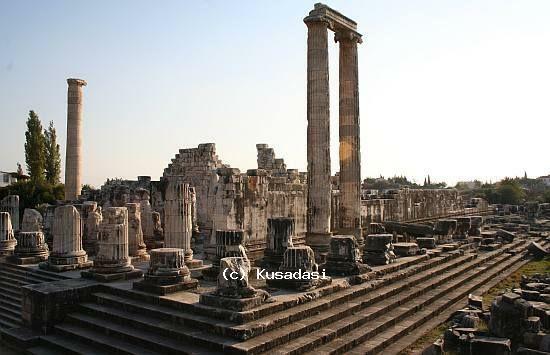 Didyma, is not however an ancient city. It was a sacred place of worship. Didyma's fame rests on the magnificant Temple of Apollo, a building of awesome scale whose proportions seem more in keeping with the gods than man. Building works in the name of Apollo were started in the eighth or seventh centuries BC. For a hundred years during the Archaic period the Temple was controlled by the Branchids, a powerful family of priests, and it was under their direction that the Temple rose to fame. In the 6th century BC, under the Branchids, in the first half of the Ionian period, the Temple at Didyma enjoyed golden age and was greatly expanded in size. But then came the Persians who attacked the area in 494 BC and destroyed the Temple. Alexander the Great helped in the rebuilding and the remains we see today are Hellenistic, dating from his times. In the temple's reconstruction the original foundations were used but the size of the building was greatly increased. The decline of Didyma began in the third century BC.